I just purchased NXT 4 mainly for MyDVD and the look of it has changed and it seems like I can't do alot of stuff that I could do from the previous version. When MyDVD first starts, it loads up Magic Mode, then when I click advanced mode it brings me to Tree Mode, then when I click on Edit Menu it takes me to the menu where you can select a theme and a theme is selected like Aerial View where it has a thumbnail on the menu and it's own text. So how do I delete the thumbnail and get rid of the text and then do my own text with my own font, right clicking does nothing and highlighting the thumbnail and clicking the delete button on the keyboard does nothing. When I add my own background the thumbnail is still there and I don't want it there? The add text option is not there either? On previous versions when you added a menu and movie it would show a project view list of what was added on the left side and then you could right click a video and go into videowave to edit it. Maybe I am doing something wrong also the slideshow option is not there. It is in the main Roxio Creator NXT Pro 4 program but not in MyDVD like in previous versions? Also how do I add a sub menu and change the buttons? Maybe I am being a complete noob or Roxio has slimmed down MyDVD. Please Help!! Please be patient until we can get hold of NXT 4 and learn enough to help you. It's quite possible that the company has slimmed this product down - they have been "simplifying" things progressively since the time the company was acquired by Sonic. Back with you soon, I hope. Ok thanks. If this is MYDVD in NXT 4 then I don't like it and I will probably go back to NXT 3. I will wait your reply. Thanks again. Yes, it looks like that is the new myDVD and the NXT 3 myDVD has been dropped. Definitely at step backwards in my opinion. Did you try using the buttons to the right of the "Tree Mode" to do the changes you want (Your last image) ? I just tried changing the background image, and music and that worked. If you left click on the text you want to change, then you can change the wording. I have not yet figured out how to change the font. BTW, I see you are attempting to make a blu ray disc. and seem to have that active. Did you buy that separately? You can change the background image and add music but the thumbnail and text that comes with the theme can not be deleted. So if you use a theme that has a thumbnail then when you add a background image the thumbnail is still there and same thing with the text. You can't delete the text that comes with the theme and add your own text and you have to use the font and text size that comes with the theme you can't change it. Yes I had to buy the blu-ray plugin separately it did not come with the pro version. I, too, am disappointed at the loss of the ability to customize the themes. I often prefer not to have music on a menu screen. Also, I seem to have to put extra spaces in the labels of the menus for it to appear correctly. Is there a way to put a return into a text label? I hope Roxio reads this forum and considers some of these changes as they update the software. I am very disappointed that they dumbed MyDVD down. That was the primary reason I bought this product each year. Very disappointed. If you bought it from Roxio direct I would return it, get a refund and try to find a NXT 3 version. The NXT 4 myDVD is a disaster. But... will NXT 3 version work with Windows 10 ? If you own it, try it. What have you got to lose. Have you used the help files AND the Learning Center at the bottom of the Home page. I count 34 Tutorials in the Learning Center that cover key points. The help guides for earlier versions contain a lot of information except for MyDVD. You did find that guide didn't you? No one publishes manuals anymore - too expensive for the number of people who actually read them. Also with a new version coming out every year, the writers can;t keep up writing, proofing,and publishing. Many companies offer pay for training' not Roxio. Ditto on all the Comments above. I have resorted to reinstalling "My DVD Video Lab HD", and I use Creator NXT only for Express projects and some of the New Features it has. The "Create DVD" on the Upper Right hand Corner of "Creator NXT 4" is deceptive, it just takes you back to the "Dumbed Down" "My DVD" It says "Create Custom Discs of you Videos and Menus and Sound Tracks" in the small comment under it. ​It is actually the Same Button in Center of the Page Labeled "Creator" then "Create DVDs" They both take you into the "Dumbed Down" " My DVD" Also I have had lot of Trouble Burning DVDs ( I wasted about 100 in all, trying to figure out the Problem). To Burn I Now Restart from C in "Safe Mode". Burn projects are Successful 99% of the Time. I Downloaded and Printed my own Manual and Bound it. To Sum it up: In my opinion Roxio owes us an Apology and an Extreme Discount on a the Next Creator release; Fortified and Restored to it former Glory. What troubles are you having burning and with what program? Why does Roxio owe you an apology and for what? I agree with all the complaints with MYDVD. I have used Roxio since 2002 and I cannot use this Roxio Creator NXT Pro 4 at all. I have always changed the look of the menu and have had four buttons to get to one of the lessons at a time. Now cannot do this. I agree with the person stating the company needs to offer an apology with a discount on a new program. I will search for another DVD program and will stop buying Roxio. Also, I tried to CHAT and the button for that doesn't work. Donnaj, not sure what your reason was for moving to NXT 4. If you didn't upgrade to Windows 10, then your previous version should continue to work fine, and if you purchased from Roxio/Corel within the last 30 days, you can return your purchase. 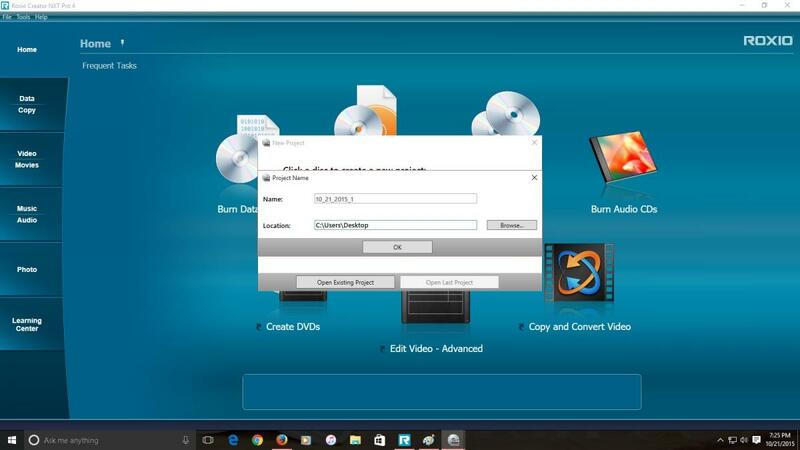 If you did move to Windows 10, from what I've heard, Creator 2012 will apparently run fine. Just dig up your old disc(s) and install that. 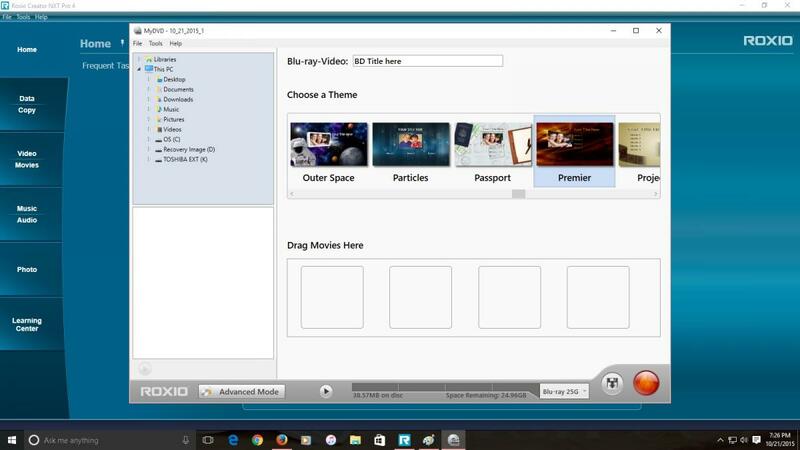 The issue with MyDVD may be one of trying for a cheaper consolidation of programs. NXT 4, Corel Video Studio and Pinnacle (all owned by Corel) now have the same "simplified" MyDVD. I bought NXT 4 because my previous version, NXT, is not compatible with Windows 10. I too am fuming regarding the dumbed down MyDVD in NXT4. I have been using Roxio for several years (EMC and NXT) and I just cannot believe that Roxio dare do this to existing customers. As well as no text editor there does not appear to be a way of adding more than one video as a single movie (the old "add videos as a single movie" option) and just have the one play button - although I may have an answer for that - AVC video converter does allow you to join videos, but I've never actually tried it. I'll look for workarounds for the shortcomings before I decide to send it back - but what then?? Look for another program - or hobby? I get the same error message if I attempt to Burn the project with a brand new disc inserted. My project is a single 20 second video. You can do all of the video "joining" you need in VideoWave. 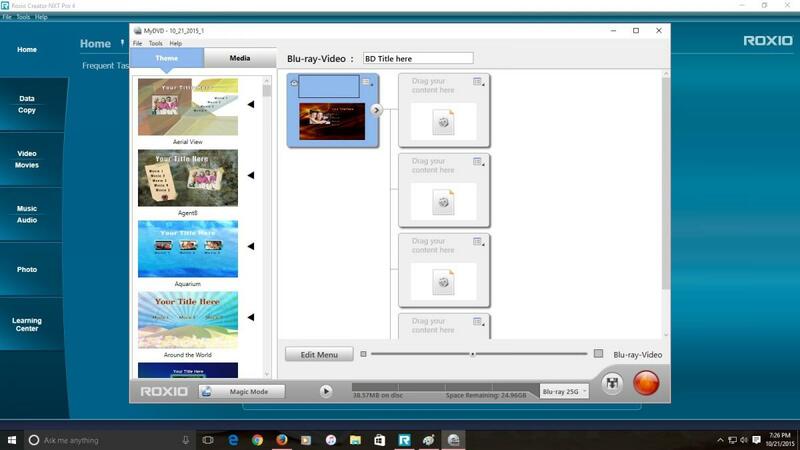 Just add the videos you want into a new project, add whatever transitions you want, then output that to a new video file, and bring that single file into MyDVD. Shut down everything else and turn off you Anti Virus then run the Install until it offers 'Repair'. Edit: I did find another Topic about that burn error message. The user in that one found out his Burner was going bad and a system diagnostic also indicated his HDD was on the way out as well. He replaced the Burner and all was well again (don't know what he did about the HDD). It also occurred when he tried to burn to ISO file. If you have another burner, try that first. Thanks for that - I am aware of that, but my final DVD is usually made up of several Videowave videos in turn made up of several short videos, and stills of course. Creating a full 40 minute DVD as a single Videwave video is not very practical. I like to arrange my DVDs into more manageable chunks. Joining a number of completed Videowave videos is extremely cumbersome - having to move videos, text, audio, etc all separately. I've yet to try AVC - I'll let you know how I fare. My bigger issue is with burning - it just doesn't work on my set up - this worked fine with NXT which is "not compatible with Windows 10". I can't find any other issues with this in the forum. I've sent this problem to Roxio as well. I'm not sure joining your completed Videowave videos would be any more cumbersome in Videowave than it would be in VLC. I would suggest you output each of your shorter segments first, as you would need to do for VLC, and then bring those completed "manageable chunks" back into Videowave to put them together. Then you've already rendered the video/text/audio, into the shorter segments, and you'd bring the rendered segments together. As for the burning portion, right... that's a different issue that Jim has presented a suggestion for. Sorry, it's AVC I'm referring to, not VLC. 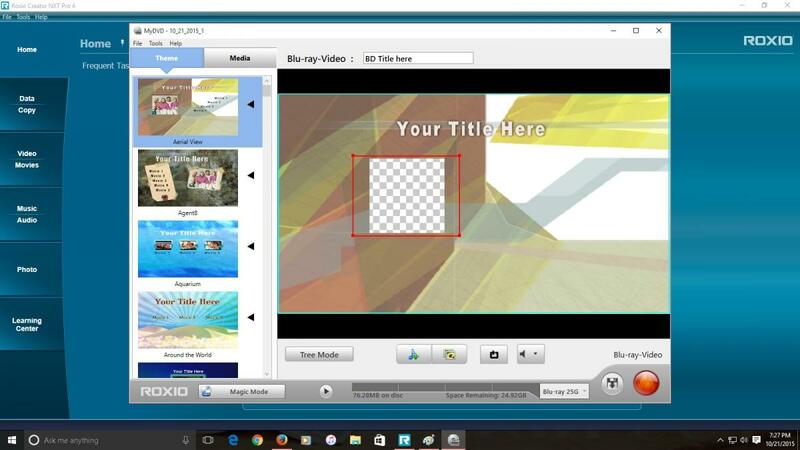 AVC is a video converter (Any Video Converter) by Anvsoft. I've used it alot for video conversion including HTML for web work, but never yet for combining files. I'll try it soon and let you know. I tried repair twice without success. I inserted the installation disc, disabled virus protection, ran uninstall, selected repair and re-booted. Does this mean I have a corrupted disc? I have a copy of RoxioCreatorNXT4.exe downloaded after receiving the disc. I could try that but I think it would be a complete installation and would probably have to uninstall the current one first - I haven't tried it yet. One comment you made about limited installs concerns me. In the past with EMC and NXT(1) I have frequently uninstalled completely and reinstalled from disc to resolve problems (not always successfully), and I haven't as yet hit any install problems. Is this a new feature with later versions of NXT? I've just re-read your last post - I do see what you mean about building up the segments in Videowave - create a video file for each original videowave and then put these together in another videowave - yes - excellent. Many thanks. My apologies for mis-reading AVC and saying VLC.